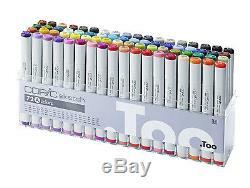 A selection of 72 Copic Sketch Markers. The assembly with a medium broad tip of 2 to 5 mm and the brush tip - super brush - make the sketch the ideal sketching marker. Also colourations can be done almost effortlessly with it! Refillable with Copic Various Ink. This set includes the following colours. E15 - E29 - E33 - E37 - E44 - E49 - C1 - C3 - C5 - C7 - C9 - W1 - W3 - W5 - W7 - W9 - G28 - G99 - BG09 - BG10 - BG15 - BG18 - B01 - B05 - B06 - B14 - B23 - B26 - B29 - B32 - B34 - B37 - B39 - E09 - YR14 - YR23 - YR24 - Y02 - Y06 - Y11 - Y13 - Y15 - Y21 - Y26 - YG03 - YG13 - YG91 - YG95 - G07 - G16 - G17 - G21 - BV08 - V04 - V06 - V09 - RV04 - RV09 - RV11 - RV19 - RV29 - R02 - R08 - R27 - R32 - R37 - YR00 - YR04 - YR07 - YR09 - 100 - 110. The item "COPIC SKETCH MARKER 72A SET TWIN TIPPED 72 UNIQUE COLOURS MANGA MARKER" is in sale since Tuesday, October 25, 2016. This item is in the category "Crafts\Art Supplies\Drawing & Lettering Supplies\Art Pens & Markers". The seller is "artistmaterial" and is located in london, London. This item can be shipped worldwide.